It’s all here in this image — the Marx Bros are behind bars. Everything is cluttered and unclear, with too many elements poorly organized, and a big empty space in the upper right. The title is slapped on top of Groucho. They can’t even find room for Harpo. This film is in trouble already. THE BIG STORE is the second Marx Brothers film I suddenly realized existed, that I had never seen. The title came to me as I was nodding off one night, and in the morning I IMDb’d it and learned that yes, there was such a film. How can one Marx Bros fan, married to another Marx Bros fan, be so slack on such things? It’s not as if there anywhere near enough Marx Bros films in the world. The supporting cast: mannequins. The leading lady has no head, and nothing below the waist. Margaret Dumont is a man. Dumbrille is a bust. Sadly, TBS is no ROOM SERVICE. It’s the last film from the Bros’ MGM period, and is a very sloppy piece of writing. Again, the studio throws in big sets and lavish musical numbers, which were never really essential — though it helps to have a glossy backdrop for the boys to demolish, I guess. But the script is pretty bad, with few memorable lines, tons of padding, and lots of downright bad visual comedy — and this from the director credited with Buster Keaton’s COLLEGE and STEAMBOAT BILL JNR. Groucho this time is a detective, (as he would be again in LOVE HAPPY) Wolf J. Flywheel , Chico is Ravelli and Harpo is Whacky. The recycling of names may suggest desperation (how hard can it be to come up with Grouchoesque names? Julius T. Hambone; Housely Q. Pinochle; Webster V. Grift; Morton P. Fingersmith; I’m not even trying here), and the plotting certainly does. Having selected a department store as setting, the army of writers struggle to integrate musical numbers, suspense, and comedy. The bland hero this time (Tony Martin) is a singer/songwriter who just wants to sell the store he’s inherited so he can open a conservatory, a project mooted in scene one and then basically forgotten about. A bunch of kids have been trained to play piano like Chico, a decent gag, and they’re all excited about the new conservatory: “New conservatory, new conseravatory,” they rhubarb unconvincingly. We’ll never see them again either. Margaret Dumont is a beloved aunt, with no real role in the plot, but Groucho can romance her and annoy villain Douglas Dumbrille, which is of course essential. Dumbrille is repeating his shitheel role from A DAY AT THE RACES, but the movie has him spend an inordinate amount of time flying through the air, replace by a stand-in (or dangle-in). This movie has more wirework than a Shaw Bros wuxia. Dumbrille is joined by various colourless stooges, of which the best is Bradley Page, underplaying briskly. But he has no reason to be in the movie. The stooges multiply like rabbits, but unlike rabbits they never seem to do anything useful. 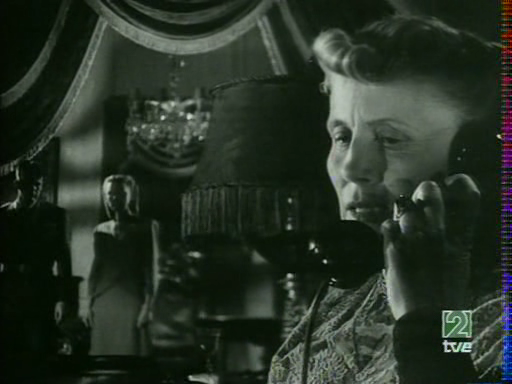 Dumbrille’s plot to cover up his cooking of the store’s books soon involves plans for kidnapping and murder: he even hints that he’ll off Margaret Dumont after marrying her. This is all de trop. It’s not really in keeping with the world of the department store. Neither are the songs. Groucho gets the uninspired “Sing as you sell,” which affords pleasing bits for novelty acts Six Hits and a Miss, the Four Dreamers (no MGM Marx film is apparently complete without an embarrassing reference to cotton fields redolent with ante bellum slavery nostalgia) and best by far, Virginia O’Brien, the deadpan comedy singer. Tony Martin croons a ballad and then a bit of faux Gerswhin nonsense called Tenement Symphony, performed by orchestra and choir in the store as part of… what? The “ceremony” that accompanies his selling of the store. MGM musicals shouldn’t NEED lame naturalistic excuses for characters to burst into song. Marion “blonde menace” Martin plays vamp, very briefly, but her vamp act consists of pretending to be a snooty music journalist. Are we outsmarting a vamp or deposing a snob? Does robbing a snob of dignity count when they’re only pretending to be a snob? And why bring her in for one skit only to forget about her? Nat Perrin is credited with the story: he had a hand in HELLZAPOPPIN and contributed dialogue to DUCK SOUP, so I’m disinclined to blame him too much. but this is shoddy work by someone, probably a whole heap of someones. 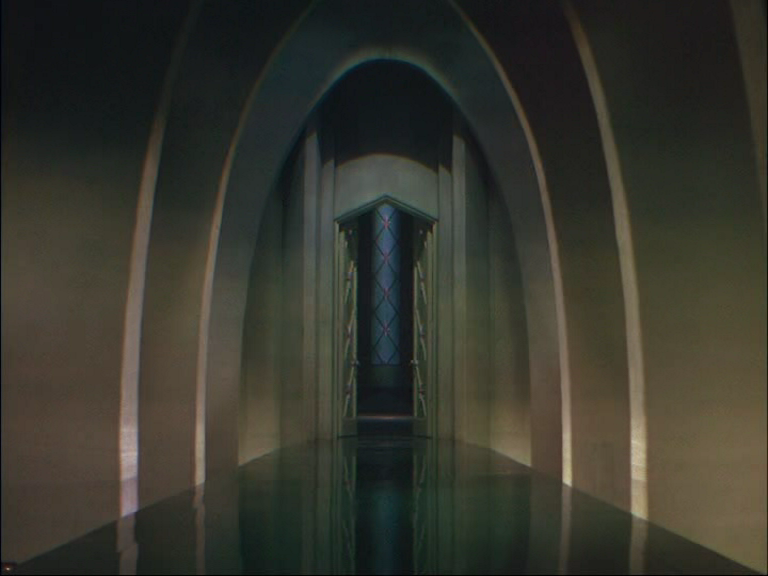 Writing visual gags for Harpo can’t be too hard, since he’s allowed to violate the laws of God and man, but he needs a sensible set of surroundings whose reality he can disrupt. Every time the movie requires him to do something, it throws in props that have no reason to be there. The usual deadly harp solo is performed in an eighteenth century room with mannequins in period garb: why does this room exist? When vases are smashed in a bit of slapstick, Dumbrille refers to them as “priceless antiques.” Why were they in a store? Why is there a moose head? Is it Chico’s from ROOM SERVICE, the one he “ate up to the neck”? What are THESE? A few cameos of interest (discounting the physiognomic startle effect attendant on any appearance by Dewey Robinson). Clara Blandick, Auntie Em, from THE WIZARD OF OZ, turns up as a Tony Martin fan (believable). Silent star/director King Baggot is in there somewhere. Come to think of it, “King Baggot” would make a good name for a Groucho character. And the movie ends with Charles Lane, so good in TWENTIETH CENTURY, repossessing Groucho’s ancient car, a “gag” which never actually develops beyond the fact of a car being repossessed: not a gag at all, then. Songwriter/producer Sid Kuller is probably a bad influence on the script, as is Ray Golden, another songwriter, and Hal Fimberg is the future creator of Derek Flint, so he doesn’t seem like the right kind of guy to have on a Marx picture. The IMDb says George Oppenheimer made uncredited contributions, and he had worked on the two best MGM Marx films, RACES and OPERA, but he was about to help end Garbo’s career with TWO-FACED WOMAN the following year. The movie has more writers than it has Marx Brothers, which would be fine if they were fighting on the same side, but every MGM movie with the Bros. is something of a battlefield in which Thalberg’s idea of classy entertainment and Mayer’s idea of family values comes up against the very spirit of what the Marx Bros should be all about — chaos. In this movie, depressingly, MGM wins. “Strangers in the night… exchanging clothing…” as Chevy Chase sang in FLETCH. But he wasn’t thinking of Anthony Mann’s little noir romance, STRANGERS IN THE NIGHT, although like his own adventure, this one features shifty rich people in big houses by the sea. Our hero is likable dullard William Terry, a marine who suffers a serious back injury and only pulls through thanks to the inspiring letters he exchanges with a girl he’s never met. On his way to meet her upon release from hospital, he bumps into cute lady doctor Virginia Grey, and we immediately suss that he’s destined to be with her. In the spooky clifftop house of Mrs. Blake (Helen ISLE OF THE DEAD Thimig), whose limp and German accent are never referred to by anybody, which is odd since it’s wartime and the heroine’s a doctor. But more to the point, Mrs Blake is off her rocker, and the true author of the letters she claims her daughter wrote to Terry. 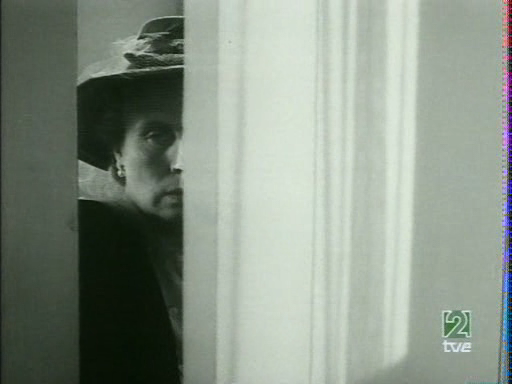 In fact, the daughter is an early manifestation (or non-manifestation) of the imaginary offspring made famous in WHO’S AFRAID OF VIRGINIA WOOLF? At under an hour, this early Mann mood piece is brisk and breezy — the plot seems to have wound through more complications than the whole of INCEPTION in its first ten mins — and shares with its no-name leads a sincere, naive charm. This is somewhat compromised by the underlying assumption that childless women are likely to go crazy and start poisoning the help (Edith Barrett, another Val Lewton favourite, known around our place as “Eyes Wide Apart”). This puts it on a par with the sexual anxieties of STRANGE IMPERSONATION, another quality early Mann. The shaky hold the film has on our conviction is loosed altogether when a character is seemingly crushed to death under an oil painting. Have you ever handled an oil painting? For a piece of canvas with a paint coating, it’s surprisingly light! But along the way we’ve had several interesting insights into marine slang — did you know that “joe” can mean “coffee”? It’s news to everybody in this film, too.